- Contains a mild apricot scent. 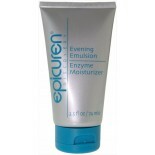 - Designed to be used by dry, mature, and combination skin types. - Not recommended for acneic or highly sensitive skin. If you're looking for a powerful, eco-friendly alternative to facial scrubs that use toxic plastic micro-crystals, Epicuren Apricot Facial Scrub & Exfoliant is the best choice. This Epicuren facial scrub is formulated with finely ground and polished apricot seeds and walnut shells that thoroughly polish the skin and strip away stubborn debris that has become lodged deep within the pores. Epicuren Apricot Scrub is also made with apricot oil, a non-greasy emollient oil that contains a potent amount of vitamin E, to help restore the skin's elasticity and clarity. This product is 100 percent vegan and cruelty-free. Purified Water, Finely Ground Apricot And Walnut Shells, Glycerol Stearate, Cetyl Alcohol, Oats, Glycerin, Safflower Oil, Sea Kelp, Natural Apricot Essential Oil, Tocopherol And Jojoba Oil. pH Range 5.5 – 6.5.